I recently attended the Safeway Culinary Kitchens Search for Our Next Chef regional cook-off event in San Francisco where four contestants tried to cook their way into the final. At the final cook-off, the winner will be given a full-time job in the Safeway kitchens and their skillet meal will be turned into an actual product sold through Safeway’s Open Nature product line. I’d say that counts as cooking under a bit of pressure, wouldn’t you? Especially when you have Le Cordon Bleu Executive Chef Mike Weller looking over your shoulder, like this. Just watching this made my hands sweaty. Not only were the contestants cooking under Chef Weller’s stare watch, but also Safeway Culinary Kitchens Executive Chef Jeff Anderson’s. 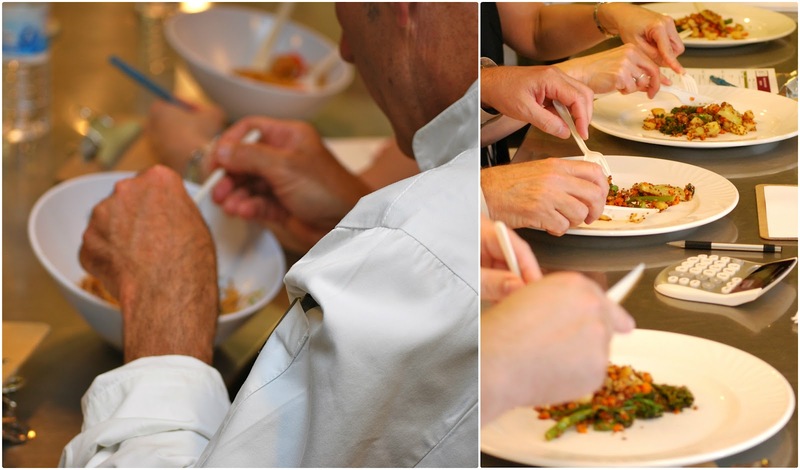 And then more nail biting as the dishes went to the judging table where they were dissected and evaluated. Again…gulp. I’ll stay in the comfort of my own kitchen, thank you very much. In the end, Chanda Clark’s chicken creole dish impressed the chefs and got her the win. You can read more about the cook-off and my interview with Alex Guarnaschelli, who will be one of the final judges, here. Onto the breakfast scramble. Before I start raving about this dish and these products, let me first be clear that I was NOT compensated for this post. I just happen to really, really like them. I’ve been a fan of Open Nature products since I attended the product launch last year, so I was happy to try out this recipe developed by Executive Chef Jeff Anderson. 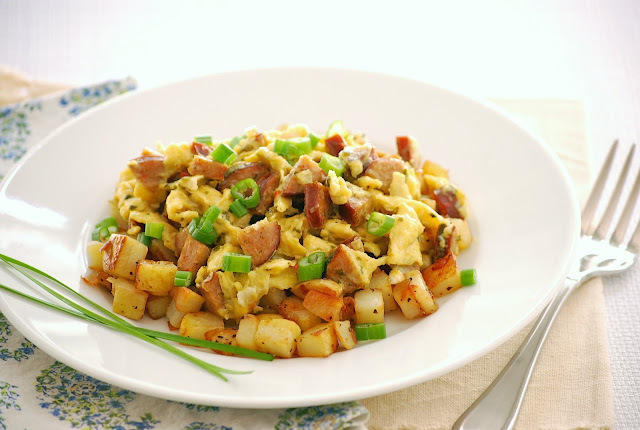 This was one of the best breakfasts I’ve had in a long time, and the flavor of the Andouille sausage was perfect with just the right amount of kick to it. We will definitely be making this again. Heat olive oil in medium skillet; add garlic and diced Andouille sausage. Cook until hot. Scramble eggs, add to the pan and cook until it reaches your own desired degree of doneness. Stir in pesto and allow to warm briefly. Serve over freshly prepared hash browns or oven roasted potatoes. Notes: I used only 1/2 tablespoon minced garlic and extra pesto to taste. Now for the good part: the giveaway! I have two $50 grocery store gift cards to give away, good at any Safeway Companies stores in the U.S. or Canada (Safeway, Vons, Pavillions, Genuardi’s Dominick’s Carrs, Tom Thumb, or Randalls). Giveaway will run through midnight PST on Friday, May 18 and I’ll pick a winner at random. Winners must have a U.S. or Canada mailing address. Tell me if you think you could handle the pressure of a cooking competition. Check out the Open Nature products and let me know which one looks good to you. Disclaimer: Safeway Companies provided gift cards for this giveaway, but I was not compensated monetarily in any way. All opinions are my own. What a fun experience that must have been. We don't have this store in our area but I have seen it in other places. Saving this great recipe;tonight egg are on the menu; this would be perfect. I know I could not handle the pressure of a cooking contest. I try hard just in my own mind and family to have good food for my family but to compete against many others that I do not know I think would be very hard and I give a lot of credence to anyone who does do it. The English Muffins look good to me and they would be great instead of toast of a plain piece of bread and they would be perfect for an egg sandwich or even little pizzas. I definitely couldn't handle the pressure! I cracked in my 6th grade spelling bee. The Open Nature Chicken Meatballs look good. I know I could handle the pressure of a cooking competition since I was a finalist at the Gilroy Garlic Festival Cook-Off way back when. The Open Nature product that looks good to me is the BACON! And I would pin this post if I could find the Pinterest button that goes with it. So let's pretend I pinned it. No, I don't think I can cook under pressure. i cant cook so there is no way i could handle the pressure! I could handle it...because really what couldn't I handle. Would I like to or would I do it? No way :) The thought makes me squirm. I'd put the chicken sausages on my list of things I want to get. They look great. @won2x following @tastytrials on Twitter. I would love to try the Uncured Bacon. I would not be able to handle a competition. I would be freaking out! I would love to try the beef franks. I love that there are no nitrates in the product. I think that I could do a cooking competition - once I were there. It's the getting there that would be the trial. I've never entered because ... I just never have. But I'd love to do it, and I just might have to someday! Wait, just one product? Gah! I think it would have to be the bacon because it's so hard to find natural bacon that actually TASTES good. I'm going to have to track these folks down. Following you on Twitter (@honestandtruly) - and happy birthday yesterday! There is no way I could handle a competition like this! I also tend to be pretty slow in the kitchen so I know I couldn't keep up the pace. I don't think we have Open Nature products at my local Safeway...I'll have to check next time I'm there! I think I'd choose to try the chicken sausages. Also, I've pinned this post. 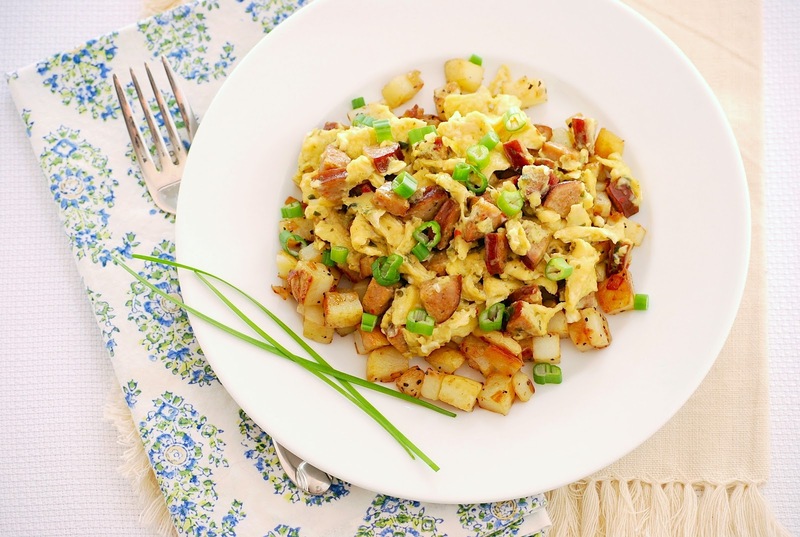 I love breakfast scrambles. We have one every morning in my house. Literally. And for some reason, it never gets old. 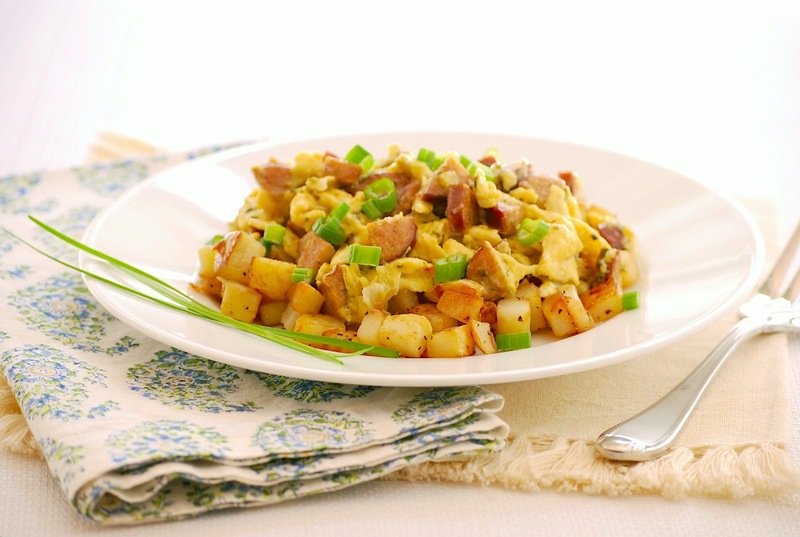 Andouille sausage is one of my faves, too, so I'm looking forward to trying this! This sounds really exciting and I love the photos! I would absolutely LOVE to take part in a cooking competition! How fun that looks. Open Nature Cream Top Yogurt looks good to me ! All Natural ! Yay ! Oh, there hummus looks good! @DearCreatives DearCreatives.com thanks for the chance! I'd be nervous trying to compete in a cooking competition!